In this edition of "Team Wear", I'm happy to report that I have new-to-me blush skinnies and a replacement for my black sweater that has pilled to an untimely death. I'm a little paranoid about looking like I'm wearing no pants in blush pants. Do they make you do a double-take? It looks like you are wearing pants! They look nice with the black sweater. Very nice - adorable side kick!! Great finds! Definitely with pants. I love the cable down the middle. You definitely look like you're wearing pants. I love the blush and black combo. 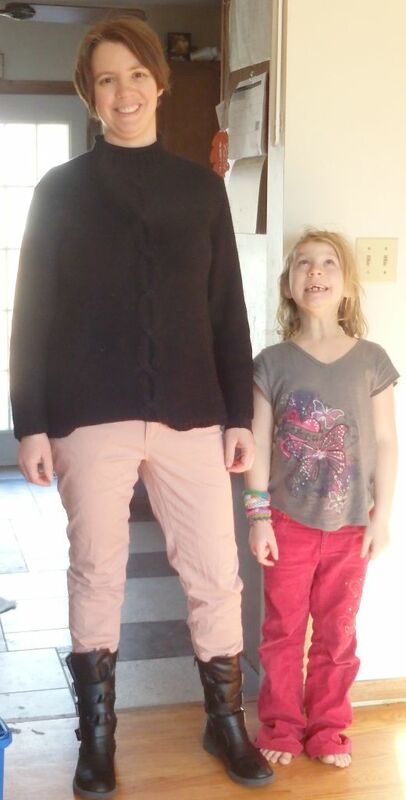 I have a pair of blush slacks (which still don't fit, boo) and I liked to pair mine with black too. Aww--you look great and your kid is very cute! I can definitely see the pants on the first take. I can see your pants :) and the color combination looks great! Cute side kick too. You are most definitely wearing pants!! :) And they look good on you, too. Nice black sweater. Yes… you are certainly wearing pants… and very nice ones if I may say so. They look great with black. Terrific thrifting score! I like! The black sweater looks like a black Kohl's one I have. One of my best, most useful sweaters IMO. No double take here! I understand the concern, though, because I tried on a pale peach top yesterday and thought it was a tad too close to my skin color for comfort. Your outfit works well, and your daughter is adorable. I always think blush and black make a lovely combination, and the trousers are loose enough that you can tell you are wearing some! I smiled, because tight pants in this colour can sometimes give the 'no pants' vibe, can't they? Yours look fresh and lovely here! No worries...we can clearly see you are wearing pants! Great outfit, and the mini-fashionista standing next to you is gorgeous, too! I like the pants (definitely know they are there) and the sweater. I think if the contrast were lower it might not feel so "naked" a color. Have you tried grey or tan with them? You certainly do not look like you don't have pants! Great find! You look great! The blush and black look wonderful on you. You look fully clothed, no problem. Of course, you look like you have pants on! I love the idea of trying these with your grey sweaters, too! Love the chunky sweater, too. I wore a similar one in Navy today!